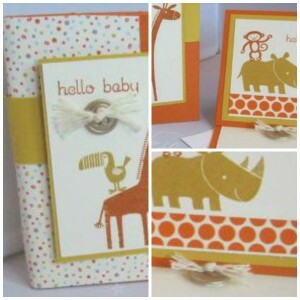 Just Julie B's Stampin' Space: Zoo Babies Mini Album! This adorable Mini Album is so easy to put together and would make a perfect gift for the “new mom” or Grandma! You can easily customize this album for any occasion such as birthdays, vacations, graduations, retirement, etc., the possibilities are endless! Pair it up with this darling mini easel card and you have a special gift for that “special someone”. This cute little project was made by Laurie Zoellmer and you can get her tutorial when you subscribe to the month of August over at Craft Project Central.